On a moonless night in the spring of 1851, a young slave makes a bid for freedom with only the North Star to guide him. Bestselling novelist and historian Robert Morgan returns with a stunning new work of historical fiction. 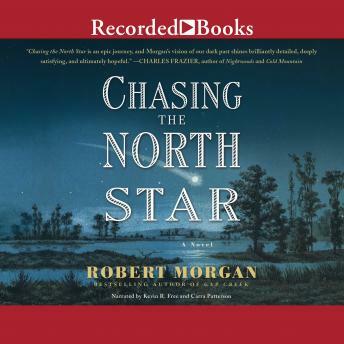 In Chasing the North Star, Morgan brings to full and vivid life the story of a runaway slave named Jonah Williams who, on his eighteenth birthday, flees the South Carolina plantation on which he was born with only a few stolen coins, a knife, and the clothes on his back. No shoes, no map, no clear idea of where to head, except north, hiding during the day and running through the night. Although Jonah eludes the men sent to capture him, the one person who never loses his trail is Angel, a slave girl he meets in North Carolina, a young woman with a remarkably free spirit who sees Jonah as her way to freedom and sets out to follow him. Morgan's clear, plain prose brings an urgency and authenticity to this spellbinding story of two teenage runaways and their terrifying world. Filled with adventure and romance, Chasing the North Star is storytelling of the highest caliber.